HOLLY HUNTER: Princeton University womens lacrosse star midfielder Holly McGarvie looks for an opening in a game last spring. McGarvie, a first-team All-American selection last year, will be a key player as the Tigers aim to make their first NCAA Final Four since 2004. 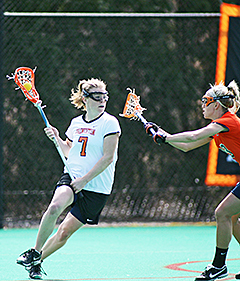 Sixth-ranked Princeton opens its 2009 season this Saturday when it hosts No. 18 Johns Hopkins. Needing a win or two ties on its swing to Brown and Yale to clinch a series at Baker Rink, the Tigers were determined to be road warriors.